It is told so often about wines, referred as “terroir expression”. I think I have definitely found a wine, really terroir expression and obviously I have tasted it. 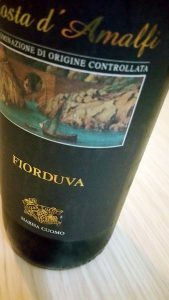 It is an extraordinary white wine, from extreme vineyards on the Amalfi Coast, in Campania, between Naples and Salerno: this is Furore Fiorduva by Marisa Cuomo. Before telling you more about the incredible tasting notes of this white wine, let me tell you more about it.Who’s the winemaker? Where is it from? What about the vine’s training system? 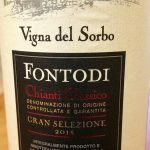 And why is Fiorduva an “extreme wine”? Here we go, with all the replies. 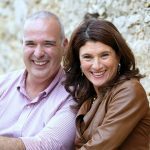 This wine is made by Marisa Cuomo and Andrea Ferraioli (and their winemaker, Luigi Moio). 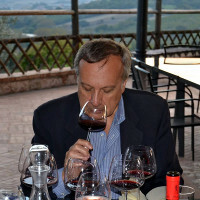 They got married in 1980 and Andrea gave his bride the small vineyards, heritage from his father. 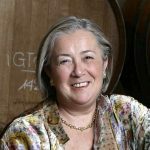 This is how the winery Marisa Cuomo was founded. What about the vineyards, then? 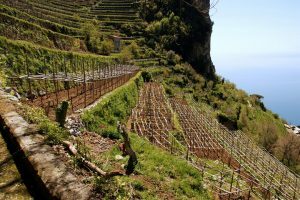 Very special ones: about ten hectares, grown pergola (a local vinegrowing system) climbing over the rocks and stealing land to the sea. At about 600 mt a.s.l. the vineyards overhanging the terraces seem to touch the Tyrrhenian sea. This is how Furore looks like, the “neverland”. From latin, “Terra Furoris” is referred to the fury of the sea waves breaking against the cliffs. 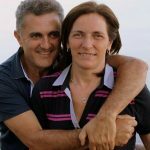 For years, Andrea and Marisa have been building terraces for their vineyards, encompassed by short walls of rocks, growing unknown local vines: Ginestra, Ripoli, Fenile, Pepella, Sciascinoso, Tintore, Tronto and many more. It has been and still is a fight against Nature to conquer every single strip of land. 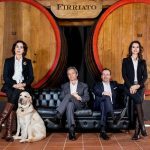 All this and the passion, toughness and love for their land, make this white wine full and fine at the same time: one of the most praised Italian white wine in the world. And I am glad to tell you more. My tasting notes. 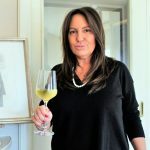 Marisa Cuomo – Costa d’Amalfi Furore Bianco Dop Fiorduva 2016 from grapes Ripoli 40%, Fenile 30% and Ginestra 30%. It is bright golden yellow. It opens with aromas of peach, apricot, ripe lemon, followed by flowers of broom, chamomile, thyme and sage. But that’s not all: notes of papaya, grapefruit and candied fruits, while a brackish and rocky note is clearly on the background. If you put your nose again (and, believe me, you would not refrain to do it !) the aromas suggest you the wave breaking on the rocks. On the palate it is balanced, smooth, enveloping, with a nice saltiness: this is a masterpiece! On the backtaste, pink grapefruit again. This is not A white, this wine is a palate’s killer application, but for your senses as well, as the more you taste, the more you want to drink. 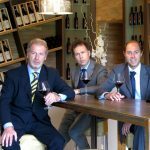 At the end, Fiorduva is an extreme heroic wine, that tastes of sea and rock, is gold as colour and smells of sun light. 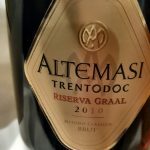 Some technical info: These specific vineyards grown on the Coast at 200-250 mt asl, South, in a soil made up of dolomitic and chalcky rocks. Winemaking: overripe grapes are harvested and brought healthy and safe in the cellar. After the soft crush, the run-off juice is fermented with selected yeasts at 12°C for three months in French oak barrels.